As soon as you enter the lobby of the Hyatt Wild Oak Ranch, you know you’re in Texas. In fact, the setting is so luxuriant, with leather sofas, stained wood ceilings and native flagstone floors, you half expect to walk in and shake the hand of Lyndon B. Johnson. In his place is a gracious staff not only ready to ensure your family’s vacation is memorable, but to implement unique changes so when you return, there’s always something new to try. It helps that the Hyatt Wild Oak Ranch is continually expanding, adding new pools and lodging choices. Still, it remains more intimate than the much larger Hyatt Regency Hill Country Resort & Spa located across the street. The Ranch is a Hyatt Residence Club property — timeshares that are rented out to the public when the suites become available. They cater solely to leisure travelers, so the moms and dads you meet will be wearing swimsuits, not business suits. 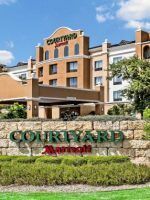 The property is really the best of both worlds — there’s a free shuttle across the street to the larger Hyatt, so you can experience the golfing, spa and waterpark, but the Ranch has its own lazy river and water slides with far less people. This is not a place where you need to wake up early in the morning to snag your chaise lounge chair. 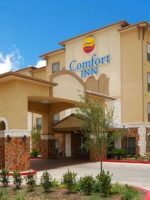 Nestled amidst the woods of the Texas Hill Country, you feel embraced by nature and you might very well spot raccoons and deer. Add spacious two-bedroom suites with full kitchens and you begin to understand the allure. 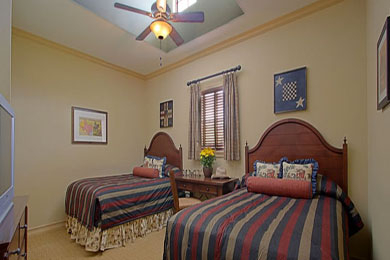 The cornerstone of the Hyatt Wild Oak Ranch is the spacious studio, one-, two- and three-bedroom suites. The Texas ranch dÃ©cor extends to these condos, with leather sofas, stained oak woodwork and Texas-themed prints, like wildflowers and cattle hanging from the walls. Enter the suite and you immediately see the full kitchen, complete with cupboards full of pots and pans, a full size refrigerator and freezer, dishwasher, microwave, toaster, blender and coffee maker. All rooms comes with free Wi-Fi access. Beyond the kitchen, you'll find a dining room table that seats six and a living room with a queen sofa bed, two leather chairs and a flat-screen TV with a DVD player. A library of DVD's is available at the front desk, along with a library of books. 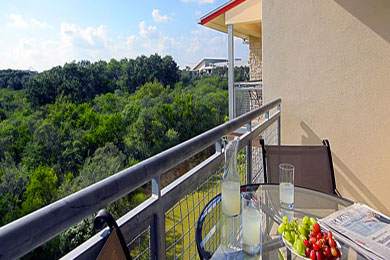 Walk past the living room and you'll reach the long balcony, which overlooks a live oak forest. Since these suites are primarily occupied by tenants who spend a week or more on the property, a washing machine and dryer connect the living room to the first of the bedrooms. The Master Bedroom features a king bed and adjoining bathroom with a Jacuzzi tub, walk-in shower and the luxury of a double vanity. Across the hallway is a second bedroom, with two twin beds and a second bathroom. When you take into account the pullout sofa, the two-bedroom suite accommodates a family of six. If you still need more room, consider the three-bedroom option, which simply adds another bedroom and bathroom, and can house up to eight people. Pack n' Plays and air mattresses are also available for no extra fee. Wild Oak Ranch offers excellent accommodations for everyone in your family with beautiful facilities and recreation opportunities. The staff were very friendly and helpful. I did not use the recreation facilities this trip so I do not know if they have changed but during previous visits they were very nice. I will be returning soon! The property is nice, the pool is nice. There is an indoor and outdoor part. The outdoor part isn't that large....during busy times it would be a nightmare. The waterslides aren't that fun. Camp Armadillo is expensive and felt awkward. My kids loved the sand volleyball and shuffleboard. It was nice to be able to use the neighboring Wild Oaks Ranch resort as well. We hung out there one day and paid $30/kid to do the wave rider for an hour. They loved that! The lazy river wasn't heated and was FREEZING. There's so much activity going on during the course of the day that it's almost impossible to pin down. Let's start with Camp Armadillo, located near the main pool, the Windmill Pool. Available to ages 3 to 12, Camp Armadillo is open 9 a.m. to 5:30 p.m., and 6 p.m. to 10 p.m. for a Parents Night Out. You can drop the kids off in the air-conditioned facility or feel free to stop in and play with your children. There is the requisite arts and crafts and the chance to play Nintendo Wii, too, yet so much more. Princess for a Day is the chance to get your little darlings all gussied up with hair-dos, make-up, nails, and, of course, a flamboyant dress so they're ready to meet Snow White. Kids also get the chance to be a superhero for a day. Dress up as Batman, Superman or Thor and rid the Ranch of evil villains. Another highlight is Zoomagination, where a local wildlife expert comes to the property with his cache of exotic animals from around the world, like wallabies and pythons. Camp Armadillo also hosts a number of events throughout the day. In the morning, come to the hut to get a glitter tattoo. The afternoon features bingo, and every evening at 8 p.m., a family-friendly movie, such as "Frozen" or "Despicable Me 2," is shown. Near Camp Armadillo is a playground with slides and a merry-go-round, and beyond that, Rattlesnake River is home to the 800-foot long lazy river. Cabanas are located on the shores of the river and available on a first come, first serve basis. There's also a sandy beach where kids can create sandcastles. Not far away from Rattlesnake River is Windmill Pool, a heated indoor-outdoor pool with two fast waterslides. Both the pool and lazy river have zero-entry points, easy on the young ones. There's also pool volleyball, pool basketball and at the far side, a sauna and steam room. Note: there is no lifeguard on duty at any of the pools and water slides have a 48-inch height requirement. Upstairs is a small game room with air hockey, a pool table and video games to please both young and old, including the classic Galaga. Next to the game room is a fitness room that features the latest treadmills, ellipticals, stationary bikes and free weights. Fitness is indeed another one of the highlights of a Ranch visit. On any given day, you might find yoga, water aerobics, a beach workout, soccer and even a superhero workout! Other activities throughout the day include a mile-long walk on the Nature Trail with a naturalist, a scavenger hunt, wine tasting some of the Texas Hill Country vintage, and a S'mores buffet with various types of marshmallows and candy at the fire pits in the Wildflower Pavilion. On the far side of the Wildflower Pavilion is a putting green where a golf pro from the Hyatt across the street comes to give you pointers. 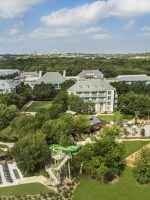 As mentioned, guests at the Ranch have access to the Hyatt Regency Hill Country Resort & Spa and its 27 holes of golf and water playground. 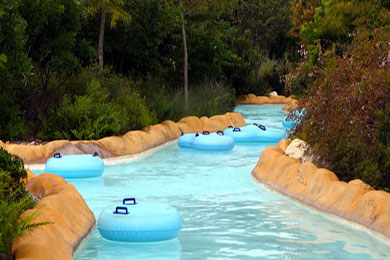 In May 2014, the resort opened Edge Falls, a new wave machine that gives swimmers the feeling of surfing. With an HEB grocery store located five minutes down the road, most families stock up on food for the week. There's also a charcoal grill next to each unit, so you can barbecue like a true Texan. If you forget to purchase deli meat, beer or wine, the Icehouse, just off the main entrance, is a small store selling anything you might have forgotten. They also feature Starbucks Coffee and lattes, and extensive breakfast and lunch menus that include egg sandwiches, bagels, croissants, oatmeal, cereal, yogurt, fresh fruit, sandwiches, soup, chili and pasta salads. 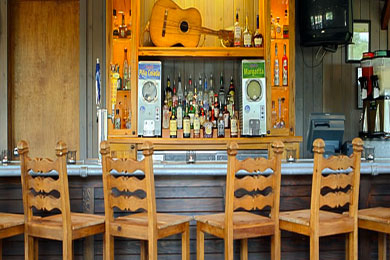 J.B.'s Poolside Restaurant is the premier restaurant on property, though casual in dress due to the family-friendly theme of the Ranch. Open for lunch and dinner, with breakfast served seasonally, expect Texan and Southwestern favorites like burgers, steak, redfish, fried oysters, and of course, barbecue. Parents beware: the restaurant is known for making strong margaritas. High chairs are available. Rattlesnake River Bar and Windmill Pool Bar also serve light fare, like sandwiches, salads, and burgers for lunch for the swimming contingent. 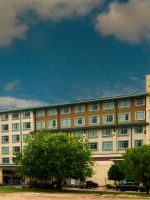 Across the street at Hyatt Regency Hill Country Resort & Spa, dine in elegance at the Antler's Lodge, open for dinner and known for its regional farm-to-table cuisine, or the Springhouse CafÃ© with a buffet the size of Texas for breakfast, lunch and dinner. Free self-parking is available, as is a media center with a TV, computers and a printer. SeaWorld is only 1.5 miles away, and the Ranch not only offers free shuttles, but also provides discounts to exclusive opportunities, such as meeting the beluga whales with a trainer. Ask at the front desk for packages. The shuttle runs regularly throughout the day. The resort also prints The Cactus Connection, a newsletter that details all activities for the week. 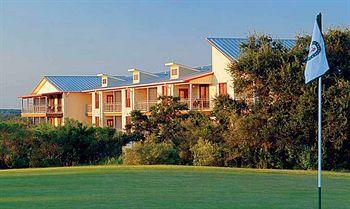 Thanks to the indoor pool in winter and the cool Texas Hill Country breeze in summer, the resort is popular year-round. Spring break in February and March is ideal, but also the hardest time to find a rental. From San Antonio International Airport, exit onto Airport Blvd. Make a slight right to merge onto Loop 410 West and continue approximately 12.5 miles. Take Exit 9A, onto TX-151 West towards SeaWorld. Drive 2.7 miles and exit onto Military Drive. Take a right onto Military Drive and go about a quarter of a mile. The resort entrance will be on the right. You can also hire a taxi for approximately $45. 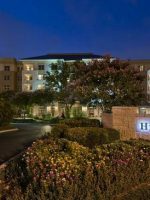 Take the complimentary shuttle across the street to the Hyatt Regency Hill Country Resort & Spa's Windflower Spa. The Windflower Signature Massage uses the spa's own scent of lavender and citrus oils. Warm linens are placed on top of your body, allowing the oils to penetrate the skin for that perfect blend of aromatherapy and relaxation.